The Fayette County Commissioners announced Thursday they will be asking the community for financial support for a new county jail at the May 7 primary election. At Thursday’s commissioners’ meeting, the three board members, with assistance from Fayette County Assistant Prosecuting Attorney Dan Drake, passed two resolutions and confirmed the ballot language for the proposed new “adult detention facility” on Robinson Road. The commissioners passed a resolution Thursday declaring the necessity of an additional tax levy in excess of the 10-mill limitation imposed by state law. The 1.9-mill levy that will appear on the May ballot is broken into two pieces — the first covers the amount which will be required to pay the interest on and retire the bonds at 1.05 mills (or $0.105 per $100 of tax valuation) with the current tax valuation of the county at $866,635,240. The second piece of the levy is .85 mills for a continuing period of time for the purpose of securing the funds to pay for operating expenses associated with the jail and other criminal justice services for which the commissioners may make an appropriation under the ORC. Following the gathering of proposals for “Construction Managers At Risk (CMAR),” — which were requested to be received on Wednesday — it was unanimously decided to accept the recommendation of the selection committee tasked to choose a CMAR for the new jail: Granger Construction. A CMAR is a delivery method which entails a commitment by a construction manager to deliver a project within a “guaranteed maximum price.” Granger — who came in at a guaranteed maximum price of $20,778,225 — has worked on other facilities and projects similar to the proposed jail. In accordance with the Ohio Revised Code (ORC), the commissioners approved a resolution for the need of issuing general obligation bonds of the county in the amount of $20 million to build the new jail. The bonds will be dated for around June 1, and thanks to extra work on behalf of the United States Department of Agriculture (USDA) funding before the government furlough, the bonds will bear interest at a rate now locked at 4 percent annually. This percentage will save taxpayers about $9 million total over the life of the loan if they pass the levy issue in 2019, according to Dean. Dean also said that any additional costs over the $20 million — which could be up to $778,225 — will be covered by the county’s “rainy day” fund that has been collected over the past couple of years in the event of such a need. The commissioners reaffirmed that this money is already the taxpayers’ and can easily cover this portion of unknown, yet possible jail expenses. In an article by the Record-Herald in September of 2018, commissioner Tony Anderson said a new jail is needed because the current jail is massively overcrowded and simply outdated in accordance to the ORC. Fayette County Sheriff Vernon Stanforth echoed Anderson’s concerns about the current jail. Stanforth said the jail was built in 1885 and has been in continuous use since then. According to recommendations from the state based on the square footage of the jail, it should house no more than 28 people. There are, however, 55 beds in the jail and additional cots for when all of these beds are full. As a result of the constant overcrowding of the jail, many inmates are released early. Sometimes, they have the option of working toward early release by doing everything from mopping the jail’s floors to doing the laundry. Finally, according to the Shremshock needs assessment, due to the struggling economy many agencies within Ohio are reducing budgets. State legislation recently proclaimed that for Ohio to avoid building another new prison (which is necessary to mitigate the overcrowded prison system) the current prison population must be reduced. The state believes this can be done by refusing to accept offenders convicted of fourth and fifth degree felonies, therefore leaving it up to the local governments to burden the cost. Though currently this only adds about 20 offenders for Fayette County over the next 30 years, with the current jail already near max capacity all of the time, it is not possible to continue to house all inmates in the current jail, showing a need for a new adult detention facility more than ever, according to the commissioners. 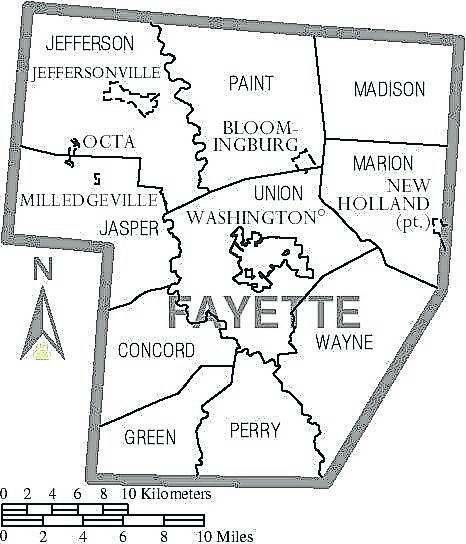 The information in this article was provided by the Fayette County Commissioners. For more information contact the commissioners at 133 S. Main St., suite 401 in Washington Court House. Their office hours are Monday through Friday, 8 a.m. to 4 p.m. They can be reached at (740) 335-0720.